University of Oklahoma senior linebacker Jordan Evans has been named the Big 12 Defensive Player of the Week for his standout performance in OU’s 45-24 victory over No. 25 Baylor Saturday. In helping OU improve to 7-0 in conference play, Evans posted a team-high nine tackles, two sacks, two interceptions and two pass breakups. In doing so, he became the first player in Oklahoma history and the first FBS player since at least 2012 to record at least two interceptions and two sacks in a game. 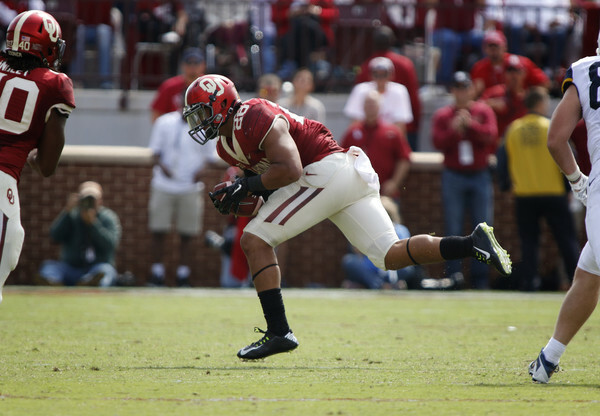 His first interception came at the OU goal line and led to a 91-yard TD drive that put the Sooners up 21-0. He returned his second pick 23 yards to the Baylor 1-yard line in the fourth quarter. Samaje Perine scored on the next play to give OU a 35-10 lead. By limiting Baylor to 24 points and 504 yards of total offense, the Sooners held the Bears below their season averages in both points per contest (39.8) and total offense (541.8 yards per game). Evans entered the game with two career interceptions, including one earlier this year against Kansas, and doubled the total Saturday. The Norman, Okla., native now leads the team with his three picks this year and ranks sixth in the Big 12 with his 7.6 tackles per game on the season. In addition to his team-leading 76 tackles and three interceptions this year, Evans ranks second on the team with his 8.0 tackles for loss, 2.5 sacks and four pass breakups. By being named the Big 12 Defensive Player of the Week, Evans joins Eric Striker (2015) as the only Sooner linebackers to win the award since 2008. No. 8/8 Oklahoma is back in action Saturday at No. 9/10 West Virginia. Game time is set for 7 p.m. CT and will be shown to a national audience on ABC.